Some say Sweet & Sour Prawns are delicious but some say it does a disservice to the prawns. 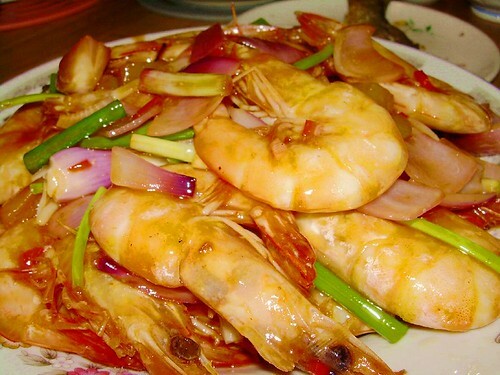 Fresh prawns (especially those caught from the sea compared to prawns reared in freshwater) is delicious cooked by steaming them with julienned ginger and a dash of chinese cooking wine so that you can taste the natural sweetness of the prawns. As for those less fresh prawns, one might want to consider “masking” it by cooking it in sweet and sour sauce. It is not to say that it does not taste great. This dish tastes good in itself and some kids love them. But it is a matter of choice as tastebuds vary from one person to another. Heat oil in wok and fry the prawns for 30 seconds till shell completely turned to red or cooked. Dish out and set aside. Remove oil from wok leaving approximately 2 teaspoons of oil in the wok. Saute the onions and ginger till fragrant. Return prawns to wok, add seasoning and water. Stir well to coat the prawns. Sprinkle spring onions onto the prawns before dishing out. For variety, you might want to add cubed cucumbers, pineapples and / or capsicum when you saute the onions. good to see yet another blog featuring home cooked recipes. cheers! Yummie dummieS : Welcome welcome! This looks easy enough for me! Now I just gotta buy my ketchup or maybe kar-po some from a fast food restaurant :p.
Nice recipe…I love prawns and the picture is making me hungry!